It was a beautiful evening for baseball at Hadlock Field in Portland. The game time temperature was 56 degrees with plenty of sunshine. The park was full of fans, a marching band played the National Anthem, and the smell of concession food gave the park that “Opening Day” feel. Unfortunately for the home crowd of over 5700, the Connecticut Defenders pitching staff stole the show. Despite a strong pitching performance from Junichi Tazawa, the Sea Dogs fell to Connecticut 3-0 on Thursday night. Tazawa, making his first professional start, lasted 5 innings, throwing 66 pitches (44 of them strikes). He allowed 1 run on 4 hits, 7 strikeouts, 1 walk, a balk, and a hit batsman as many of his fellow countrymen watched from the press box. In the fifth inning he allowed a lead-off triple to the Defenders Mike Mooney and retired the next three batters and left Mooney stranded at third. Tazawa was critical of himself after the game. ”(The outing) was so-so,” said Tazawa through his interpreter. “I allowed easy hits tonight." Sea Dogs manager Arnie Beyeler was much more complimentary of his young pitcher. 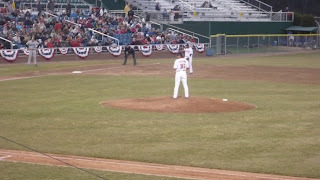 The Defenders pitching staff did a great job keeping the Sea Dogs off the base paths. After Argenis Diaz grounded out with the bases loaded and two outs in the second, the Sea Dogs only had one runner in scoring position for the rest of the game. 5 Connecticut pitchers combined on the 4 hit shutout, as starter Daryl Maday lasted 4 innings. Mike Musgrave got the win, retiring all four batters he faced. Dan Otero got the save by getting the final two outs of the ball game. Beyeler gave a lot of credit to the Defenders pitchers for shutting down his team's offense. The only run Tazawa allowed came in the fourth inning on a two-out double by Brett Pill, who went 2-4 on the night. Dustin Richardson relieved Tazawa in the 6th, and after a scoreless frame allowed a long home run to center field to Mooney, who also finished the game 2-4. The final Defenders run came on a Brian Bocock single in the eight inning off of Bryce Cox to score Jackson Williams. Although Tazawa took the loss, Beyeler put it into perspective. Notes: C Mark Wagner went 1-3 and threw out two runners trying to steal second...Chad Rhoades pitched a scoreless 9th for the Sea Dogs...This was the first game of a four game series against Connecticut to open the season.